It's time to extend your reach, literally and figuratively, with the numbers row. Reaching this row requires a much larger stretch than any of the letters, but if you've been doing the exercises regularly to warm up your fingers won't have any trouble. It is easy to remember where they are and the proper fingers to use, because it is simply like counting on your fingers, in reverse! It goes from 1 to 0 (think of "0" as "10" for this! ), starting the count with the left-hand pinky finger, ending with the right-hand pinky finger. Instead of counting the thumbs use the index fingers for two numbers. Easy-peasy! Take a moment to tap your fingers on your desk/table/thigh while saying the correct numbers for each finger, as in the above diagram. Do it forwards & backwards! I've included two extra keys you've already learned in a previous lesson, the comma and the period, since they are a part of the number system. Remember to keep the hand that is not typing resting on the home row. Do not try to cheat by keeping both hands resting on the numbers row. The exercise Do You Have My Number? 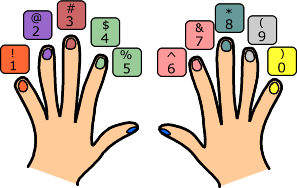 will help you develop a kinesthetic memory for where the number key are in relation to the home row. When you've got this mastered, do something from the typing practice section to keep your other typing skills sharp. As always, keep in mind those Principles for Effective Learning!